Materials engineers and scientists study the synthesis, processing, and characterization of substances within these general classes of materials: polymers, metals, semiconductors, ceramics, glass, and composites. An understanding the molecular structure and well-designed processing are the keys to engineering materials with outstanding properties. Novel materials are tailored to meet the needs of targeted applications and become the foundation for all engineering disciplines. Such materials enable many new technologies and are found in various forms in electronics, optics, architecture and transportation, biomedicine, aviation and aerospace, pharmaceuticals, energy generation, environmental engineering, and numerous industrial systems. Our graduates are in high demand by industry and are employed at excellent salaries by prominent companies. Those going on to graduate school are well prepared and are highly recruited by prestigious graduate schools worldwide. 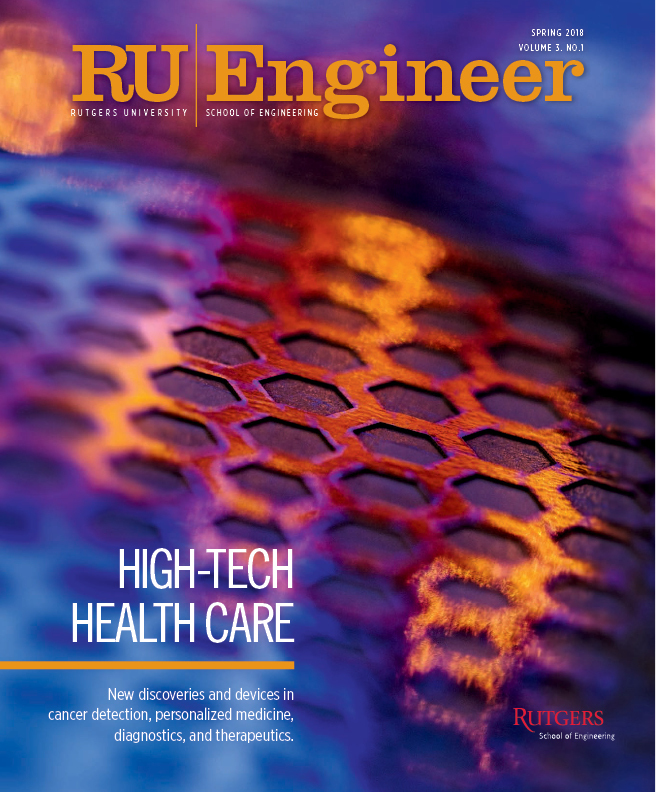 The Materials Science and Engineering Department is committed to provide qualified students with a relevant education in materials science and engineering preparing them for a productive and rewarding career. Students study the chemical and physical nature of materials at the macro, micro, and nano scales. Early on you will take courses in crystal chemistry and physics of materials, followed by more focused study of phase equilibria and the measurement of thermal, electrical, and optical properties. The later stages of the curriculum emphasizes the intricate but defining relationships between structure, properties, and processing of engineering materials, with emphasis on applications and materials design. 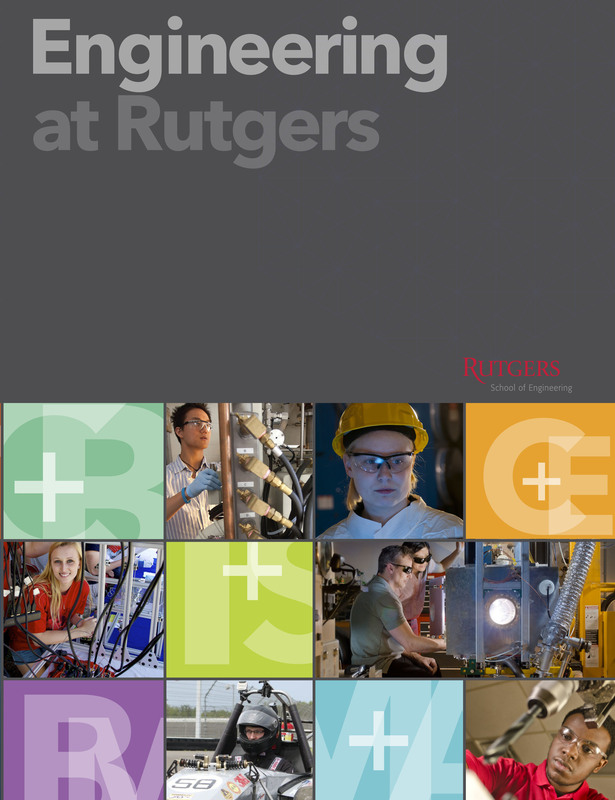 In the senior year, undergraduates design their capstone course in preparation for graduate studies or an industrial career in the materials industry in a diverse range of categories that include research, development, marketing, process engineering, and technical sales. How Can I Specialize in a Certain Area? 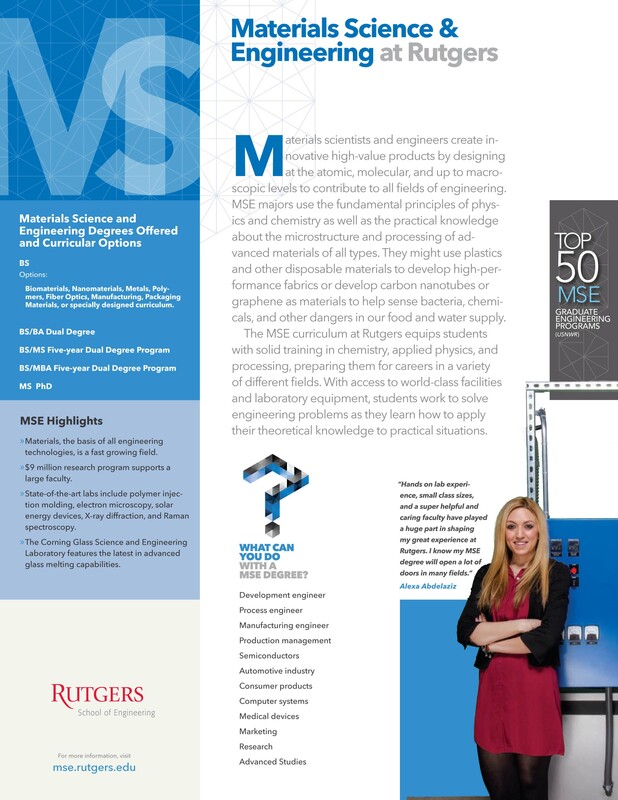 Most importantly, the MSE program encourages a student to select an area of focus in one of the following areas: biomaterials, nanomaterials, metals, polymers, fiber optics, manufacturing, packaging materials, or in an area designed specifically to meet an individual student’s educational and career goals. This specialization is accomplished via the selection of technical electives in the targeted area. The faculty is highly regarded in many materials areas, such as biomaterials, photovoltaics, glass, polymers, structural ceramics, composites, nanomaterials , piezoelectric and ferroelectric ceramics, advanced thin-film engineered materials,research, fiber optics, microelectronic and packaging materials, electroceramics and battery materials, ceramic and metallic surfaces, and theory and computational modeling. The department also has a unique facility for fiber optics research and one of the most advanced materials characterization facilities in the nation. This one is easy. Our faculty has been known since the earliest days of the department for their commitment to teaching and the mentoring of students as they grow and mature through their studies. We take our teaching seriously and take pride in giving clear lectures, conducting interesting and effective laboratories, and taking students out into the real world on plant trips to see how materials science and engineering is applied in industry, commerce, and national laboratories. The undergraduate curriculum in materials science and engineering leads to a bachelor of science degree. The curriculum is designed to allow the student exceptional flexibility in designing a program that fits their specific needs, interests and goals. The curriculum in designed to exceed the requirements necessary for accreditation by the Accreditation Board for Engineering and Technology (ABET).